Liberation Theology and Sexuality is a book about 'doing Liberation Theology in Latin America' in the twenty-first century. The style of doing theology remains the same, but this book reflects the work of a new generation of liberation theologians developing a theology that offers a wider and more complex critique of reality, with new perspectives on issues of sexuality, race, gender, culture, globalization and new forms of popular religiosity. Liberation Theology and Sexuality shows how Christianity in Latin America needs to take into account issues concerning sexuality and poverty, together with traditional religiosity and culture when reflecting on the construction of Christian faith and identity in the continent. For the first time, Liberation Theology and Sexuality presents a unique combination of Latin American theologians from more than one generation, reflecting on depth on these issues. 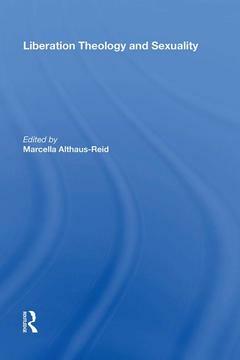 Contents: Introduction, Marcella Althaus-Reid; 'Let them talk...!' Doing liberation theology from Latin American closets, Marcella Althaus-Reid; Once again liberating theology? Towards a Latin American liberation theological self-criticism, Otto Maduro; Queer eye for the straight guy: the making over of liberation theology, a queer discursive approach, Ivan Petrella; Oh que sera, que sera... A limping a/theological thought in Brazil, Claudio Carvalhaes; Commodity aesthetics and the erotics of relationship: challenges of feminist hermeneutics of liberation to market aesthetics, Nancy Cardoso Pereira; The prostitutes also go into the kingdom of God: a queer reading of Mary of Magdala, Martín Hugo Córdova Quero; Liberation theology, modernity and sexual difference, Frederico Pieper Pires; Liberating Mary, liberating the poor, Mario Ribas; Seriously harmful for your health? Religion, feminism and sexuality in Latin America, Elina Vuola; Worship and the excluded, Jaci Maraschin; Love in times of dictatorships: memoirs from a gay minister from Buenos Aires, Roberto González with Norberto D'Amico; Index.